In 2012, China became the world’s leading trading nation, surpassing the United States. China’s total imports and exports reached $3.87 trillion. The import trade value in 2012 stood at $1.82 trillion, which marked an increase of 4.3 percent from the previous year. 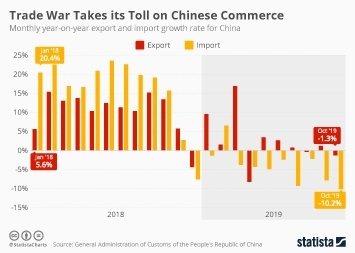 As of 2012, China’s main imports were: crude oil ($220.7 billion), iron ore ($95.6 billion), plastics in primary forms ($46.2 billion), copper and copper alloys ($38.6 billion), and soybeans ($35 billion). China’s major trading partners were the European Union, ASEAN, Japan, South Korea, and the United States. The European Union was China’s largest source of imports with $212.1 billion accounting for 12 percent of China’s total imports. ASEAN exported goods worth $195.8 billion to China, representing 11 percent of the total imports, while Japan controlled 9.8 percent of China’s import market with an import value of $177.8 billion as of 2012.